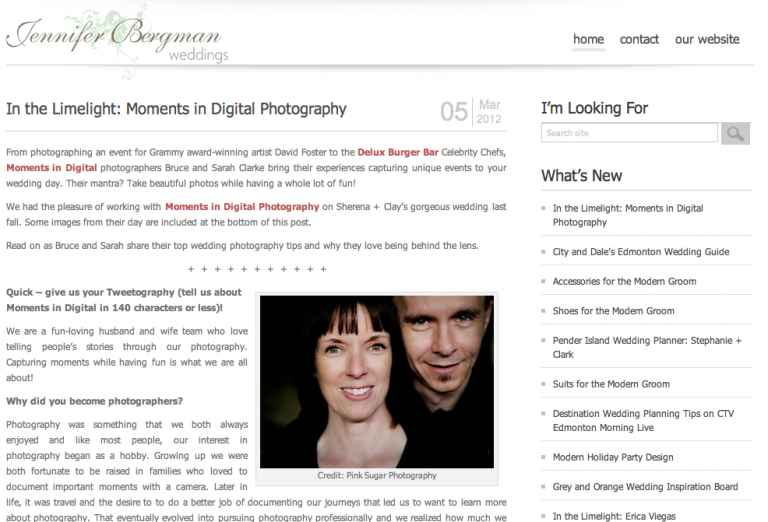 This week Sarah and I are thrilled to be featured on Edmonton Wedding Planner , Jennifer Bergman Wedding’s blog. We had the pleasure of working with Jennifer on Sherena + Clay’s wedding last summer and were so happy when she asked if she could feature our photography on her website. Be sure to visit her blog and leave some comment love for us. If you’re a bride and groom getting married in Edmonton or surrounding areas, you should definitely get in touch with Jennifer to find out about the wedding planning services she offers. Hiring a wedding planner is probably one of the smartest wedding decisions you can make (next to picking your partner and hiring awesome wedding photographers of course!). They’ll help you save time and money and help take the stress of your shoulders so you can just relax and enjoy your wedding day.